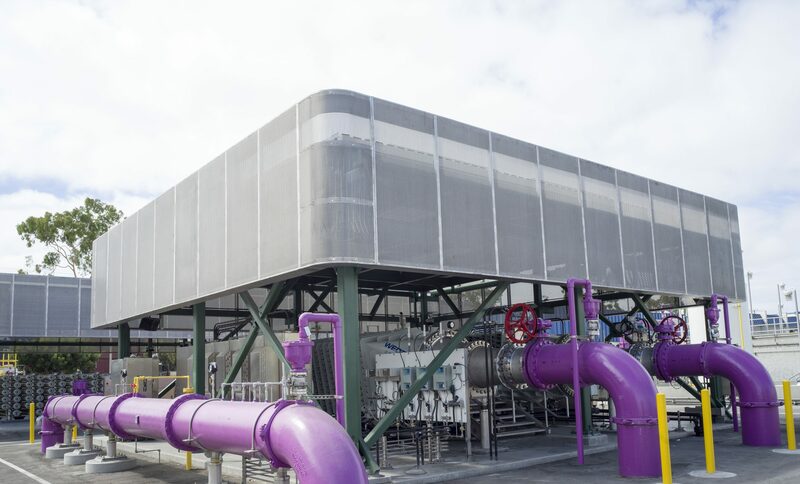 The Institute for Sustainable Infrastructure (ISI) announced today the Advanced Water Purification Facility at the Terminal Island Water Reclamation Plant (TIWRP) in Los Angeles, California has earned the Envision Platinum award for sustainable infrastructure. The purpose of the $48 million Advanced Water Purification Facility project, funded by California Proposition 84 (the Safe Drinking Water, Water Quality and Supply, Flood Control, River and Coastal Protection Bond Act of 2006) is to provide safe recycled water purified for potable reuse to the surrounding area. Planning for this project started back in the mid 1980’s and the construction of the facility was broken into two phases. Phase 1, completed in 2001, provided 6 million gallons per day (MGD) of recycled water using microfiltration, reverse osmosis, and disinfection with chloramine, and a pipeline distribution network to accommodate up to 22 MGD of recycled water for future phases. Phase 2, completed at the end of 2017, increases the capacity of the facility from 6 MGD to 12 MGD and replaces disinfection with chloramine with a more advanced oxidization process (AOP) that uses a combination of ultraviolet light and sodium hypochlorite. This is the first facility of its kind to use this particular AOP which, in addition to providing high quality potable water, also results in economic benefits compared with more traditional treatment processes. The City of Los Angeles, Bureau of Engineering, Environmental Engineering Division (EED) worked in close collaboration with Parsons, Carollo Engineers, MWH (now Stantec Consulting), and Walsh Construction to deliver this award-winning, sustainable project. The Envision sustainable infrastructure rating system assesses sustainability in five categories: Quality of Life, Leadership, Natural World, Resource Allocation, Climate and Resilience. These contribute to positive social, economic and environmental impacts on a community during the planning, design and construction of infrastructure projects. Constructing the Advanced Water Purification Facility involved retrofitting the existing Terminal Island Water Reclamation Plant with new water purification processes and technologies. This required a thorough examination of potential risks to public health and safety. For example, independent testing of various water filtration systems was commissioned, with the aim of securing a water purification technology for the facility that would efficiently and effectively deliver the best water quality results while mitigating user exposure to potentially hazardous chemicals and pollutants typically associated with other water purification processes. In all, six treatment technologies were thoroughly evaluated before the ultraviolet light and sodium hypochlorite AOP was selected for this project. Although the project is located within the interior of the TIWRP which has been traditionally off-limits to visitors, the project team devised ways in which to open the facility up to tour groups to educate the public about the facility improvements and the innovative treatment technology implemented at the site. Treatment Plant Tours are made available to the public by advanced reservation. Furthermore, an on-site learning center focusing on water recycling and reuse has been planned for and budgeted. The City of Los Angeles, including the LA Bureau of Engineering (BOE) and Bureau of Sanitation (LASAN), have been active participants and contributors to the development of uniform water recycling criteria for direct potable water reuse in State of California. LASAN and other project partners worked extensively over years to develop the water recycling criteria for direct potable water reuse, the results of which made the implementation of this new and innovative water purification treatment technology at the TIWRP possible. These efforts are also paving the way for this technology to gain more widespread adoption throughout the State, all in an effort to solve critical water shortage challenges and reduce risks to communities reliant on aquifers for their potable water supply. The Advanced Water Purification Facility at the TIWRP will have a long-term positive impact on the receiving groundwater basin. This project provides recycled water for non-potable and indirect potable reuse and therefore decreases imported water by the City of Los Angeles. The Facility will completely reuse all recycled water produced and will cease to discharge tertiary effluent (water treated with chemicals) into the nearby harbor. Purified water by the plant will be distributed to Harbor area industrial users and the Harbor Generating Station for process water, Los Angeles Harbor for irrigation, Machado Lake for lake augmentation, and some will be sent to the Dominguez Gap Barrier which will allow up to 100% subsurface injection of recycled municipal wastewater to prevent seawall intrusion into groundwater sources.